Twin Towers 7th floor 2bedrooms 2bathroom, spacious. High on level 7 at 1 Marine Parade. Across the road from Main Beach surf lifesaving club, Mauao walking tracks and thermal pool complex. All prime Mount Maunganui activities are on the doorstep plus excellent cafes, restaurants and shops. Expansive views from the generously sized kitchen and spacious living area. Covered balcony is perfect for balmy evenings with refreshments in hand or breakfast with a view. Turn to your left for a look at Main Beach or to your right to see Pilot Bay and in the evening, the sparkling lights of cruise ships. 2 Bedrooms with views, 2 bathrooms, onsite pool, spa, gym, sauna, car park. Due to the security in the building, I will email before your arrival asking for a postal address. I will post a key that will enable you to access to the building. If you don’t have cell data, Wifi packages can be purchased from Oceanside. The apartment is super spacious and bright. The location is fantastic, opposite the beach and surrounded by deliscious restaurants. Would absolutely stay here again! Great location opposite the beach. The apartment although older it is really well maintained. Great size in the living spaces. We stayed as a family of 5 and there was plenty of room for all of us. The apartment is in a great location with restaurants and shopping all within walking distance. The Mount is next door and beautiful views from the balcony. Definitely recommend this property. Great apartment, great views. Common area pools need attention. Fantastic location at the base of the Mount. Very large comfortable apartment with great facilities. Perfect location. 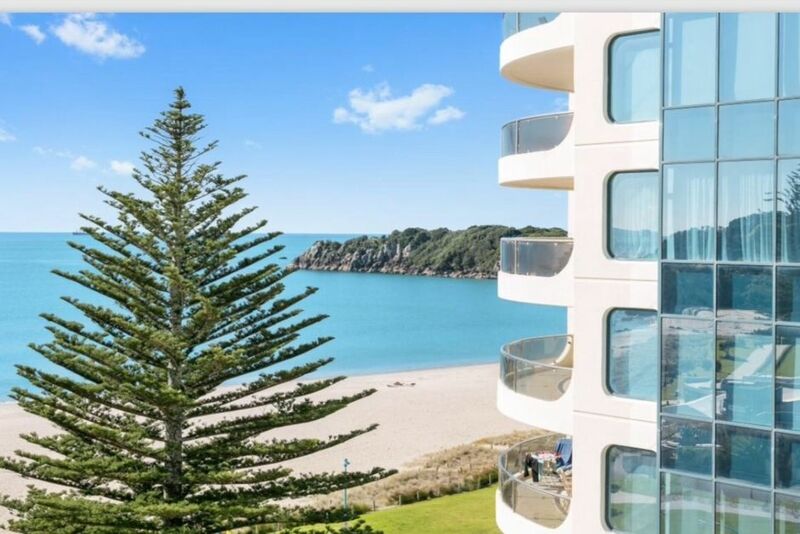 Right across from beach and next to Mount Manganui. The apartment was clean and we'll appointed with two bedrooms two baths (one adjoining bath and one in hallway) and a large living area with comfortable seating. A large balcony with table overlook the bay and a bit of Mt. Manganui. About an hour's drive from Rotorua and Hobbitton. Washer, dryer, dishwasher. Note that food shop is in the other side of town. There are some good eating places just outside of the main door. Security is high at the flat, so we felt very safe. Owners Sandy and Graeme seem very nice and accommodating. Overall excellent visit and would definitely try to stay here again or next visit from the States if Sandy and Graeme would have us!